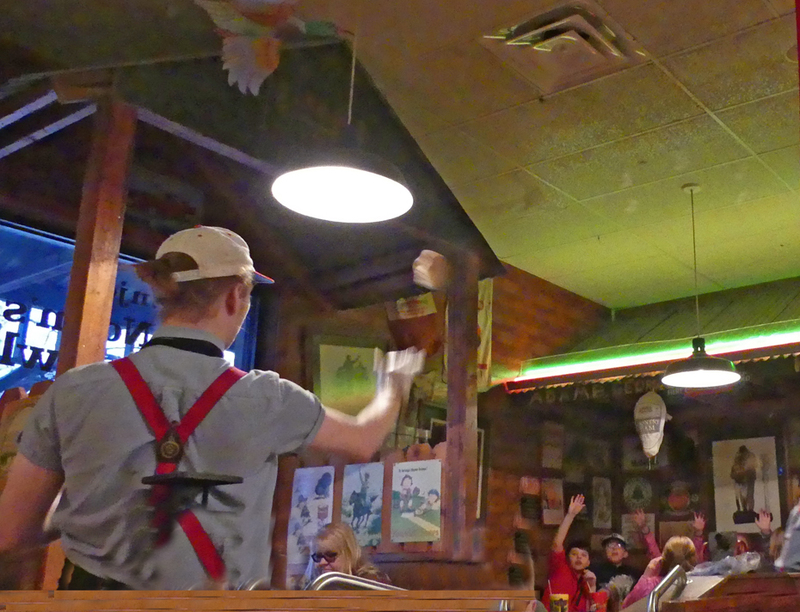 Lambert's Cafe in Sikeston Missouri is known for throwing your food at you. Yes, at least the rolls. The rest of the side dishes, they bring to your table and heap your plate to overflowing. You pay a ridiculously low price for the amount of food and the entertainment of watching those "Throwed Rolls" is free. Lambert's began a long time ago; 1942 to be exact. Earl and Agnes Lambert had a dream and not much more. 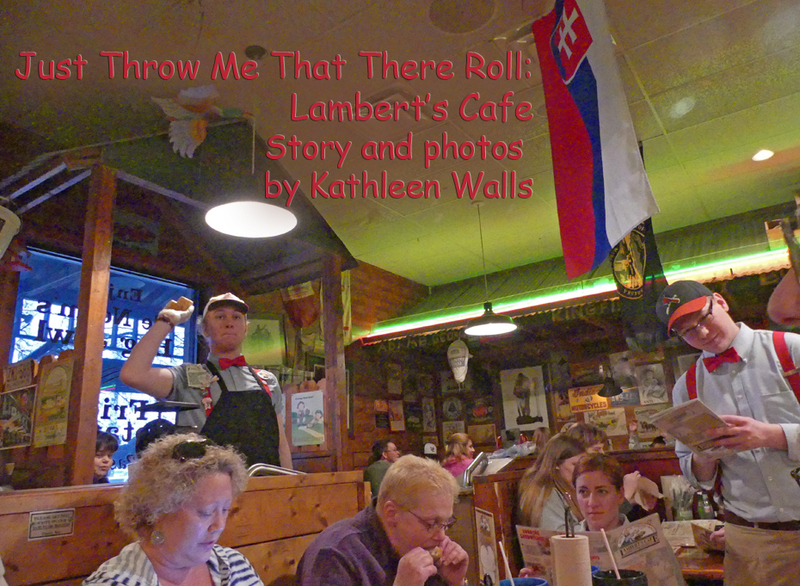 They made that dream, Lambert's Cafe, come true by means of hard work and treating each customer as if he or she was a very special person. The philosophy worked and the business thrived. People came from all around for the good down-home food. Then in 1976, Earl passed away. Agnes could not handle the restaurant by herself so their son, Norman and wife Patti, came into the business. Norman was not a man to stand on ceremony and he didn't want to compete with the white-tablecloth-and-fine-china restaurants. He wanted to emphasize their own brand of good country food. He switched glasses for fruit jaws for the drinks and deliberately used mismatched china. Everyone got generous portion of meat, vegetables and dessert with each meal. It worked. Their little cafe became a very busy place sometimes a server could not get close enough to a customer to hand him a roll. One day a hungry customer told Norman "Just throw the da**ed thing." Norman did and the practice of "Throwed Rolls" became a trademark. Today after several moves to accommodate the ever increasing throngs of customers wishing to have rolls thrown at them, Lambert's is a third-generation restaurant with Norman's son Scott on the mound. The day we ate there, the crowd was lined up out the front door. It was worth the wait. As we waited for our waiter we watched a server throw those rolls. By the time we placed our order I was heading for full from the rolls and pass around okra and other side dishes. It was a hard choice for an entree. I considered the BBQ ribs, meatloaf or even steak. 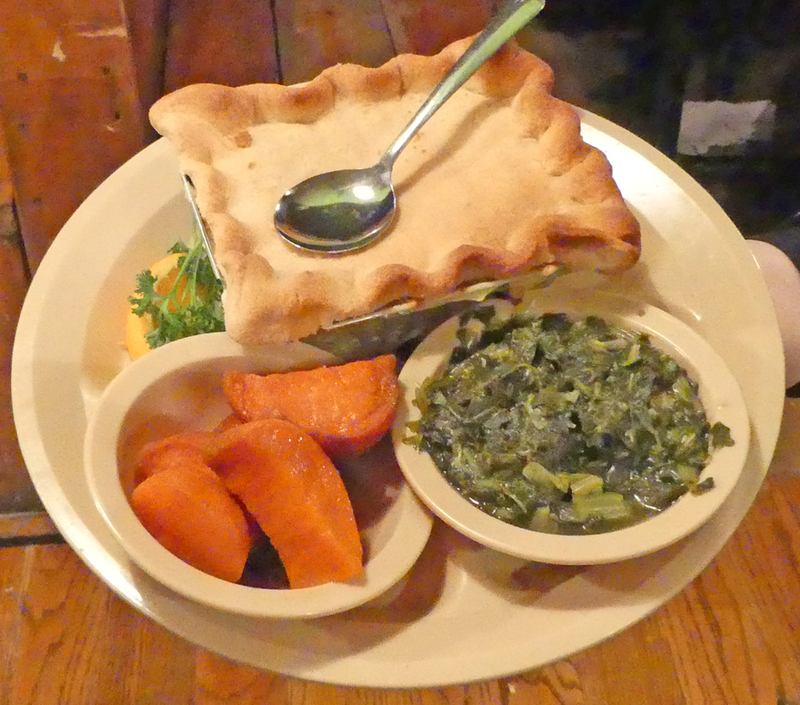 I decided on a chicken pot pie with sides of candied yams and turnip greens. I usually skip eating hte crust but the crust of that pot pie was crispy with lots of gravey on the inside. That plus the servers continued around with huge bowls of fried potatoes and onions, mac and tomatoes and black eyed peas. Still I couldn't pass up the dessert. I choose the peach cobbler. It was homemade tasting biscuit crust and tender real peach inside. 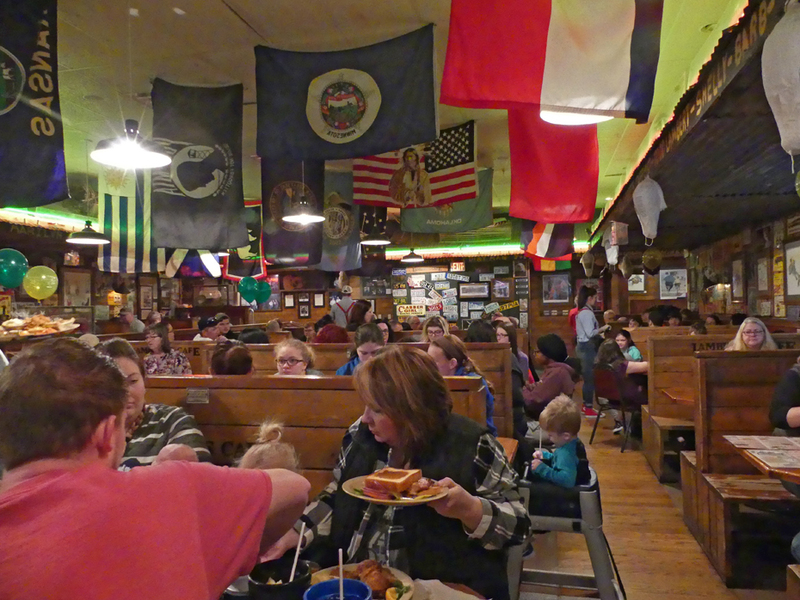 Lambert's has been featured on 101 Tastiest Places to Chowdown and World's Best Places to Pig Out. If you think Lambert's appeals to just the average working Joe (or Jill) think again. The list of celebrities who have eaten there is like a busy day at the cafe, out the door and around the corner long. To name just a few, Elvis Presley, Morgan Freemen, Jay Leno, Stan Musial and William "Refrigerator" Perry; I bet he kept those pass-around servers and roll-throwers busy. And of course Miranda Lambert. 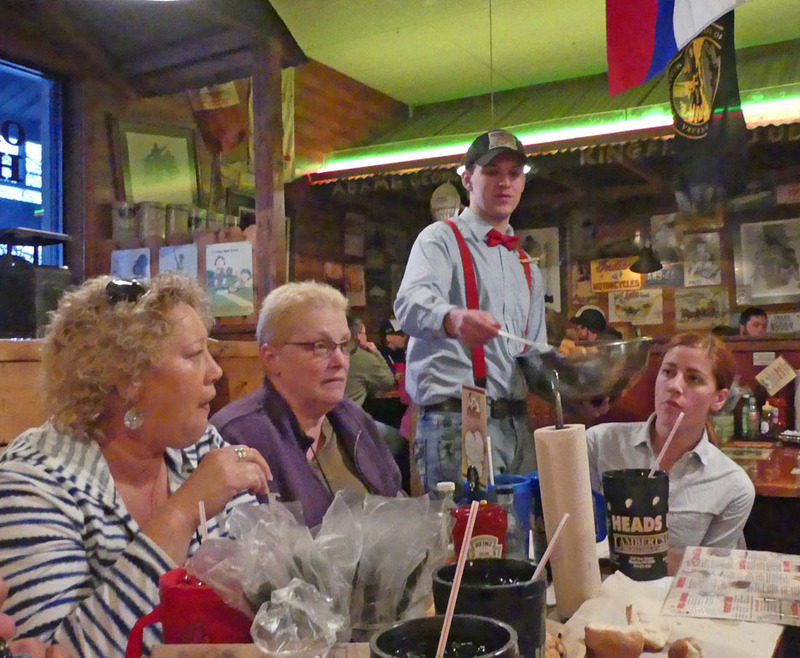 My best advice is when you visit Lambert's, skip meals the day before. You won't feel like eating the day after either.